I was keen to have a harder week this week but also wanted to make sure I’m careful with my hamstring. The session was a good one as it was mainly longer reps.
9mins (3mins recovery), 2 x 5mins (2mins), 2 x 2mins 30secs (75secs/3mins) and 9mins. The total was 33mins. I took it steady for the first few reps and was feeling okay. On the way back I pushed a little harder. I was chasing Tony for most of the evening. On the final 2mins of the final 9mins I did feel a very slight twinge on my hamstring so I made sure I didn’t do anything silly. It feels fine now so hopefully it’s fine. So I was quite happy with my run tonight. I would like to do a tempo session on Wednesday but I’m going to see how it feels before committing myself. 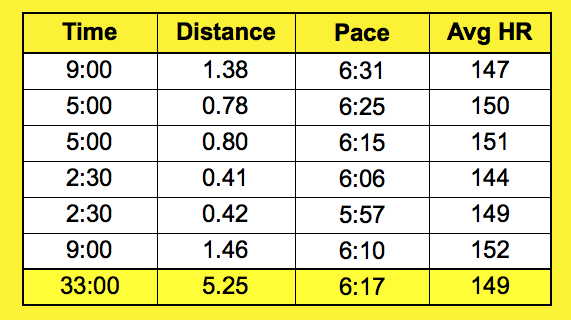 This entry was posted in Club run, Fartlek. Bookmark the permalink.